Swinging gates are the most popular type of gate for homes in Scotland as they look great, cost less than sliding gates and provide easy access for your car. Almost all driveways are able to have a swinging gate fitted, but on the rare occasion where there is not enough room for the gate to swing, a sliding gate can be installed. Don’t worry though, if you provide us with a rough estimate of your driveway size, or with a free-call out to your home for measuring purposes, we can determine wither you require a swinging or sliding driveway gate. The driveway slopes down from the road and is long so a swing gate would be more economic to install. The driveway has no where for a sliding gate to slide to. The driveway is very uneven or has a large drain. If you could have both a swing or a sliding gate, generally a swing gate is simpler to install and you don’t have to worry about keeping the track clear. 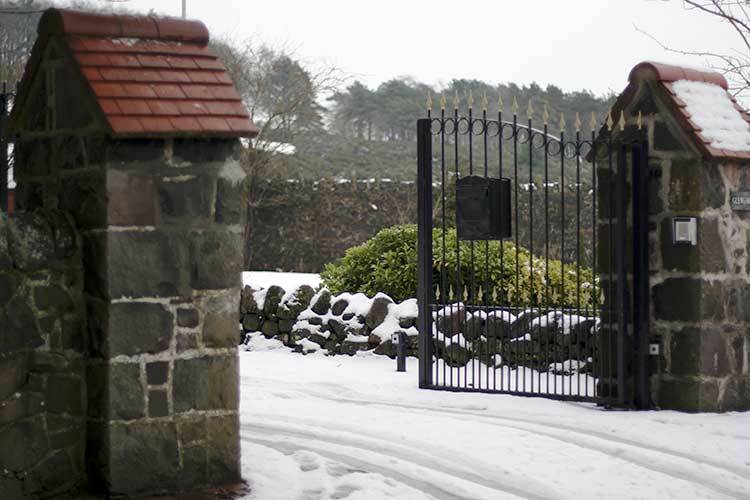 Abbey Gates can easily provide sliding gates for driveways without enough room for a swinging gate.